The IntelliMix P300 Audio Conferencing Processor, a new digital signal processor created specifically for conferencing applications, has been introduced at ISE by Shure. The P300 offers Shure IntelliMix DSP algorithms that significantly enhance the audio quality in video meetings, a variety of connectivity options, plus seamless operation with Shure Microflex Advance and Microflex Wireless microphone solutions for AV conferencing. The device is a compact, simple to install solution providing professional conferencing technology that offers the right set of features to create a highly intelligible, collaborative meeting experience in huddle rooms and medium sized meeting rooms. The fixed architecture provides simple and intuitive setup, resulting in less DSP programming and commissioning time onsite. 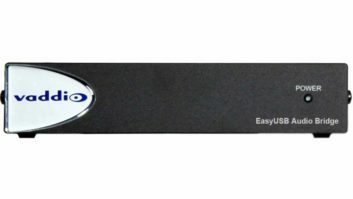 The USB connectivity enables the P300 to be used with common soft codec programs such as Skype and BlueJeans, while the 3.5mm connector means anyone on a mobile phone or tablet can easily bring any remote participant into the conversation. Its compact half-rack footprint enables discrete installation behind a display, under a table, or in a credenza.